The MexicoBlog of the CIP Americas Program monitors and analyzes international press on Mexico with a focus on the US-backed War on Drugs in Mexico and the struggle in Mexico to strengthen the rule of law, justice and protection of human rights. Relevant political developments in both countries are also covered. The Washington Post published this op-ed today by former Border Patrol directors on the completely absurd and non-viable proposal of the Trump administration to prosecute all illegal border crossings. The article is mixed in its policy recommendations, favoring other measures that continue to criminalize migrants, and hailing Mexico's terrible southern border crackdown in Central American migrants, but it's worth a read. This is a debate we must be having. If the Democrats don't stand up to the whole "border security" farce going on to enrich the few and make political hay for the racists, we will never get our of this vicious policy cycle. Alan Bersin, Nate Bruggeman and Ben Rohrbaugh worked together at U.S. Customs and Border Protection, where Bersin served as commissioner. He earlier was the U.S. attorney in San Diego. Attorney General Jeff Sessions and Homeland Security Secretary Kirstjen Nielsen recently announced a “zero tolerance” policy on border security. Though its contours have not been described in great detail, at its core, it is a commitment to criminally prosecute every person who illegally crosses the border. This strategy may provide sound bites, and harsh rhetoric may generate some short-term deterrent effect, but it is impossible for this policy to actually be implemented over any reasonable time period. By announcing a threat that is effectively a bluff, the Trump administration likely will harm border security rather than enhance it. The federal criminal-justice system is not equipped to handle the flood of cases that would result from referring every single illegal border crosser for prosecution. There is a limited number of federal judges, magistrate judges, federal prosecutors, public defenders and U.S. marshals in the judicial districts along the border. Prosecuting more than 300,000 people (the number apprehended for illegally crossing our southwestern border in fiscal 2017) would overwhelm their resources. And this is to say nothing of inadequate detention capacity; each of the illegal crossers would have to be processed, housed, guarded and fed before trial — and after, if convicted. The core of effective border security is risk management — focusing law-enforcement resources on the greatest threats. This is why the Border Patrol developed the Consequence Delivery System, a program that matches different types of crossers to different categories of processes or penalties. For example, a known human smuggler receives harsher treatment than a first-time crosser. Referring every illegal crosser for prosecution removes the ability of the Border Patrol to manage risk effectively. The opportunity cost associated with this prosecution strategy will be even more acutely felt by the U.S. Attorney’s Offices along the border. Already handling a massive workload, including drug- and human-trafficking cases, these prosecutors focus their time and effort on cases that have the greatest impact on public safety. The administration’s new “mission impossible” will force prosecutors to misallocate resources to economic migrants; but even then, there will not be enough resources to get the job done. In the meantime, organized crime, drug smuggling and financial crimes will receive short shrift. Meanwhile, the new policy is likely to have little deterrent effect. We know this from experience. For example, in San Diego during the 1980s and early 1990s, enormous numbers of illegal crossers were subject to misdemeanor prosecution. That effort consumed huge amounts of resources simply to create a revolving door in area jails. It was only when the enforcement strategy changed to focus on prevention and deterrence at the border — supported with targeted felony prosecutions and strategically situated walls — did the situation change. The administration is looking for quick fixes to illegal immigration, but action is instead needed on the difficult policy questions and trade-offs that are inherent in this arena. For example, the administration needs to strengthen its security partnership with Mexico. Demonizing Mexico may score political points, but it is directly contrary to our border-security interests. All irregular southwest border crossers transit Mexico, and since 2015, Mexico has stopped more than 500,000 Central Americans at its southern border with Guatemala. If these efforts are halted, the effect on the southwestern U.S. border is clear. One area of focus should be entering a “first safe country” agreement — which the United States has with Canada — providing that migrants from third countries claiming asylum here would be returned to Mexico to pursue their claims. This arrangement would be a powerful deterrent to economic migrants making false asylum claims, while leaving open a refuge for those fleeing extreme violence directed against them. The United States could provide assistance to Mexico to help implement the system. Rather than focusing on criminal prosecutions, the administration should be reforming the overloaded immigration court system, where backlogged cases wait years for final disposition. That means adding resources and streamlining procedures so that asylum and other cases can be adjudicated efficiently. This would yield the dividends the attorney general’s recent token offer of 35 prosecutors and 18 immigration judges cannot. “Zero tolerance” looks like an easy way to increase deterrence, but there are no easy solutions or silver bullets for a broken immigration system. While we wait for comprehensive immigration reform and a strategy for tackling the drivers of Central American migration, the administration needs to devise a deterrence scheme that is effective and sustainable. Criminal prosecution will certainly be a part of such a strategy, but if it is the only part, it will fail. Welcome to the Americas MexicoBlog, a project of the Americas Program! 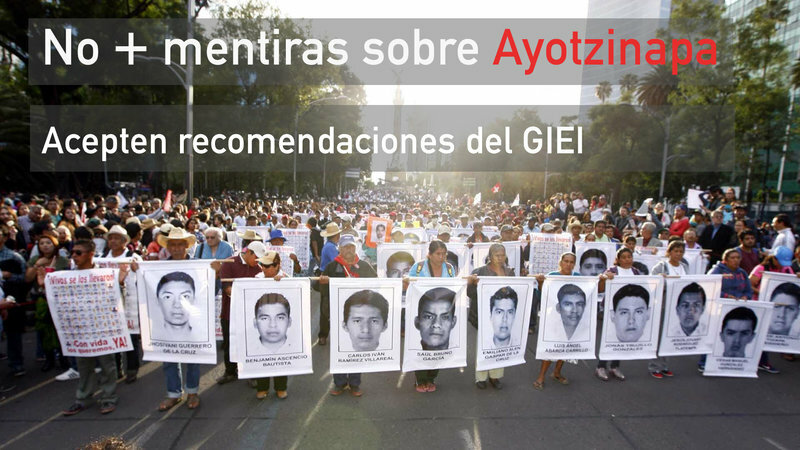 Tell the Mexican Government: No More Lies About Ayotzinapa!